14 discouraging others from editing - problem for recipes from users who later leave? 24 Would someone PLEASE help me! No, you're right. My grandfather had taken chef courses and there was definitely a style of American (read 'US') cooking called Continental, a chi chi fon fon fon style. I don't know if that's where the "continental breakfast" came from - same idea or not, I mean. Soo...was 'continental' here meant to mean 'sorted by continent'? Why don't we just do that, then? I started--change it back if you no like. I can foresee a bit of a problem, though--is this going to end up being a listing by country? Then by region within country? Are we starting the CZ International Cookbook? I don't actually care; I'm jus' sayin'. Somewhere, and right from the beginning, we're gonna have to have a *really* good index for the recipes, one that is *truly* comprehensive, so that no matter how someone is looking for a particular recipe he/she will be able to *easily* find it. Each entry, of course, will have a redirect to a single recipe. In other words, Beef Burgundy, Boeuf a la bourguignon, Boeuf a la bourguignonne, Beef bourguignon, etc. Or, of course, an alternative: have a see Beef bourguignon etc. for all the variants, directing to whatever we decide is the principle name for each item. That's a good point, of course. On the other hand, it's always useful when looks at a recipe to be told from the start how long it ought to take to make, although, in my rather extended experience in the kitchen, almost every recipe I've ever seen always grossly understates the time required, perhaps not for the actual cooking, but almost *always* for the preparation time. And if one ventures into the haute world of classical French cuisine.... My mother, my French wife, and I, three very experienced cooks, once ventured to make the classic French mother sauce called an Espagnol, which is the basis of all the great French brown sauces. The very detailed recipe said that it could be made leisurely over a weekend, while the cook took time out to dip into Fanny Hill as the stock simmered slowly. Aside from about 6 hours of driving around San Francisco to obscure wholesale meat markets, Latino markets for pig rind, etc. etc., plus a venture to a restaurant supply store to buy a *second* 15-gallon pot, it took the three of us 3 long, hard days to make the damn stuff. And it might have been *very* useful to warn us that a *second* enormous pot would be needed. And that a *strong* person is needed to *lift* the freakin' pots once they're filled. So I think that if we have a recipe for, say, Bearnaise sauce, we can assume that the average person has a couple of sharp knives, a small pot, a whisk or an electric blender, in other words the usual stuff that a well-equipped kitchen should have. For some recipes, however, it ought to be made clear what will be needed in addition to just the ingredients. Although as far as equipment goes, I think I could put my hands on a couple of classic, or semi-classic, lists of what, say, a *restaurant* kitchen should have, or what a well-equipped home kitchen for someone interested in French cuisine should have. And for Chinese cooking, let's say, it might be useful to point out that most recent tests of different methods of cooking traditional Chinese dishes at home have shown that unless you have a *professional* quality heat source for your wok, you will have more success in using an ordinary frying pan or saute dish -- home kitchens just aren't equipped to heat woks to the extremely high temperatures that restaurants use. It can be done at home, of course, if you want to cut a big round hole in a kitchen counter and then install a separate gas-burning wok heater beneath the counter (my dream, in the olden days), but I doubt if many people actually do this. Sorry, I missed the above comment before adding some stuff just a moment ago to the main article's example. In any case, my additions were tentative, just to see what they looked like and how people reacted to them. Prep. time is, of course, quite subjective, as people work at incredibly different speeds. Most of the newer cookbooks do give prep. times but, in my judgment, they are always wrong, seriously underestimating the time. The New York Times Cook Book does not give them at all. So, I agree, we're probably wasting our time with this. Equipment -- as you say, within the flow of the article. I *do* think that we want the number of servings in a fairly prominent spot, though. This, too, is somewhat subjective, but not as much as some of the other items. Mince—to chop very finely with a knife; generally vegetables but also meat. In British English, "mince" also means "ground meat". Zeste—the outer part of the peel of citrus fruits etc. Ok, I'm going to try and layout and organize what I think needs to still be done to this page to get it ready to go. Feel free to add, remove, complete a step, etc. 1. Page needs to be cleaned up - mainly removing the commentary to the talk page so we can have a clear idea as to what the page layout will look like. 2. Come to a consensus as to what headings should be included within a recipe template. For each heading, write a brief description for how they should be formatted. 3. Adopt a recipe template. Post an example on the page. Write instructions for it's usage. 4. Finish polishing the "general editing guidelines." The subpage will be limited to representative, even iconic recipes and variants of dishes. This will not be an "add your own recipe" subpage. Recipe subpages shall not editable without prior discussion and agreement of a food editor, or in his or her absence, interested authors. I would agree here as well. In fact, I would say recipes are more like pictures than like encyclopedia articles; so it would make sense to let people sign them and take credit for them. The notion that a recipe's ingredients (temperature, etc.) 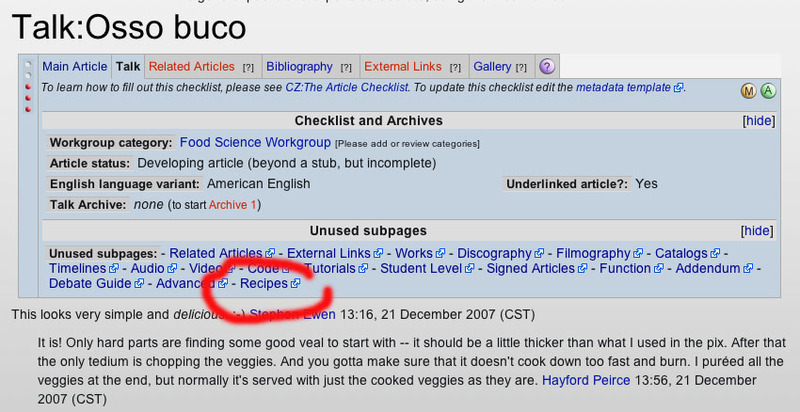 can be edited a la wiki wholly misrepresents how recipes are created. They are created in kitchens, not in wikis, and since kitchens are very particular things--just as cameras are--it in a way misrepresents the facts to the reader not to credit the recipes to their creators. Again, encyclopedia articles are another matter entirely. Indeed, on further thought, why should anyone other than the contributor of a recipe have the right to edit it--even a food editor--unless the person had actually gone to the trouble of preparing the dish according to the recipe, and then tested out the specific thing changed? Since I imagine few people will go to that trouble (30 minutes-3 hours just to test out a one recipe edit or two? ), the only person who will be justified in editing the recipe would be its original author. If someone wants to edit an existing recipe, he or she should get permission from the person who contributed it, I suspect--or else simply contribute a brand new recipe. And then we need to have a sensible but efficient and non-divisive way to decide which of possibly many recipes to keep. Boil the cod, potatoes and eggs, having cut the cod in strips and removed skin and bones. Slice the peeled potatoes with the eggs. Sauté in olive oil, with wheels of sliced onion and chopped garlic until the onion is yellow. Alternate layers of cod, potato, egg and onion in casserole dish. Bake in oven. When done, sprinkle with grated parsley and olives to taste and serve. A recipe for Bolognese sauce The following recipe was inspired by that detailed by Marcella Hazen in her iconic book but has been modified in several small ways and has been completely rewritten. It is, however, well within the classic definition of a ragù as promulgated by the Italian Academy of Cooking. Chop the pancetta by hand; pulse the onion, celery, and carrots in the food processor until fairly fine but not mushy. Heat the oil and butter in a large casserole and cook the vegetables and pancetta over medium heat for 2 or 3 minutes. Mince the garlic in the food processor, add to the vegetables, and stir another minute. Add the meats, the salt, and 1/4 teaspoon of the 1/2 teaspoon black pepper. Raise the heat to high and cook, stirring, until the meat has lost its red color. Add the milk and cook until all the liquid has bubbled away. Be very careful not to let the mixture burn. Add the nutmeg and white wine and cook until the liquid has completely evaporated. Once again, be very careful not to let it burn. Pulse the tomatoes (if necessary) in the food processor, then add to the pot, along with the sugar, the red wine, another 1/4 teaspoon of black pepper, the tomato sauce, a tiny bit of red pepper, and the water. Taste carefully for more salt, pepper, and nutmeg. Bring to a simmer, then place on a heat diffuser, reduce the heat, and cook uncovered at the barest simmer for 3 to 8 hours, stirring from time to time, and adding water from time to time. Don’t let it burn! Do not remove any oil that rises to the surface — stir it back in. Cook down to a nice consistency. The longer the cooking the better the sauce, apparently, at least up to 8 hours — after that there may be a point of diminishing returns. Serve on buttered pasta with Parmesan cheese. instead of disallowing the recipes that vary by one or 2 ingredients, why not just have a section at the bottom of the "recipe article" saying some varient ingredients. "In some recipes for baking salmon, instead of using only butter and lemon, mayonaise may be used to try to seal in... etc etc"
I don't know - just the extreme, not allowing policy seems, well, harsh and I think a middle ground could be found. Also you could have external links to variants of the same dish. Yes, I agree that not allowing editing is against the spirit of a wiki, however, I think that more drama would be caused by allowing rampant editing of recipes, because as you say, recipes are unique to the chef and will surely result in feelings of ownership. To combat this, it might be a good idea to leave the "Notes" section open to editing to add this type of information.. for example, the Joy of Cooking recipe for sauerbraten at the end says "Some cooks add raisins, catsup, and ground gingersnaps). This would allow for minor variants to be mentioned, without "ruining" someones recipe. And obviously more informative to the reader as they know there are choices. All I've been saying, is that *I*, for instance, can't then go into the Tom Kelly recipe and change the amount of salt in it. I can ask if maybe there's a mistake in the amount, but if you say No, that's the end of it. I like the way Hayford has that laid out - that formating probably needs to be included on this page. However, I am unsure about attaching users names to these recipes. First, why would anyone care what Todd Coles recipe for Bolognese is, who the hell is he? Secondly, I think this starts tredding into the self-promotion waters and we want to avoid that. "Recipes shall not editable by anyone except the individual who originally contributed it. We also strongly discourage unnecessary criticism of recipes within these page. Informed commentary is welcomed, ie, a query suggesting that the amount of a particular ingredient is seriously flawed and is possibly a typo; more subjective comments should be sent by private email to the original contributing author. " "Recipes pertaining to different countries, regions, and ethnic culinary groupings may be verified by Citizens belonging to those groups." discouraging others from editing - problem for recipes from users who later leave? Click on the "Recipes" tab at the upper right to find a representative recipe. Want to do it this way? Or do we want to rewrite the link in the Index with pipes in order to take him/her directly to the recipe? How about these random links from the recipe page. What type of qualifications for approval would you like to see? I do have some concerns that recipe pages might become bloated, which we've tried to crack down on with our policy toward distinct recipes. I disagree that a person has to cook a specific recipe to be able to validate the authenticity of it. A food science editor is going to have the knowledge of what ingredients compliment each other and what will be produced from various cooking techniques. Furthermore, I don't think you will ever find one perfect recipe - everyone has different tastes, and it is the nature of recipes to be shared with other people and modified to suit individual tastes. I have to admit that I don't see the rationale for CZ to be a compendium of recipes. As Stephen mentions, the seminal version of a recipe (provided the copyright stuff works out) would make a certain sense in an encyclopedia, as would a single, representative recipe (in most cases) to be read in conjunction with the article. I don't see why it makes more sense to have seven different mai tai recipes; to my mind, it would make more sense to have the two original recipes, and then a discussion (in the text of the article) of the way mai tais have evolved over the years. The rationale is obvious to me: CZ is a reference resource; recipes are items of information that one might expect to find in a reference resource. This doesn't constitute "mission creep" except insofar as you think the entire Subpages framework constitutes mission creep; that framework allows us to incorporate all sorts of reference material in an orderly fashion. A couple of days ago I posted a request in the Forum, asking for someone to explain to me how I could add a Recipes Tab at the top of any given article -- it obviously can be done, but I certainly can't figure out how, although I have now spent a lot of time switching back and forth between the metadata templates of, say, Bolognese sauce, which has a tab, and Bearnaise sauce, which doesn't. To me, the two metadata pages are absolutely identical in every way except for a few names. I have also gone to the so-called Help pages about added subpages and they are absolutely useless! On the page that apparently tells us how to add sub-subpages, which is apparently what needs to be done, it says to go to the metadata page and, at "tab1 = " to put in the name of the requested Tab. I got news for all you fans out there: there ain't not "Tab1" or "Tab2" on the metadata pages! Hayford, see the red circled recipe link on the talk page. This page was last modified 10:39, 26 May 2008.